Do you like drinking soda or other carbonated drinks? If so, I’m sure you’ve wondered if it’s healthy to drink them. Well, carbon dioxide is absorbed into the bloodstream via the stomach walls. Handily our bodies are very good at removing carbon dioxide from the blood – this is the function of the lungs. If there is more carbon dioxide than can be absorbed by the stomach, you will burp. It’s man made, sort of. It’s made when brewing beer and wine – it’s a by product, so it’s made by yeast, but it’s not an unnatural product. It’s in the air we breathe, after all – and we put some of it there, by breathing it out. What’s the need for it to be put into our body? There’s no need. It’s not a joke on humanity – it makes drinks taste good. I have a sodastream, so that I can add carbon dioxide to my water at home. I drink that. I often put some orange juice in it, because that also tastes good. If it’s a joke, it’s a joke I’m playing on myself (and I don’t think it’s a very good joke). Drinks that are designed to be carbonated don’t taste good without it. Flat coke tastes bad. 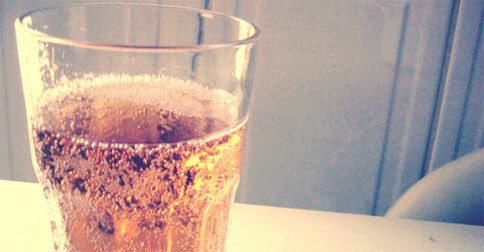 Flat champagne is not just white wine, it’s not very nice. So to summarize… when you drink a carbonated drink, then you get hydrated and the extra carbon dioxide gets exhaled. The question if it’s healthy is a general fear of modernity. There’s nothing wrong with something being man made, and bubbly water isn’t going to hurt you — but be aware though that most carbonated drinks like soda has a lot of sugar and artificial ingredients — now that what makes them unhealthy.